Happiness studies have become one of the most substantial of well-being studies. It attaches multi dimensional issues of individuals, social life, economics, physical aspects and also quality of life. In particular, certain urban built environmental characteristics have significantlyinfluenced the quality of life and happiness of people. Since most people live in urban environments, it is important to examine the interaction between urban amenities, people, and how it unfluences the attainment of happiness. The importance of urban amenities is largely related to accessibility within neighborhoods, people’s perceptions about the use of amenities, and their behavior in daily activities. A happy place can be achieved by creating accessible amenities nearby to support the ease of mobility and activity among neighborhoods. 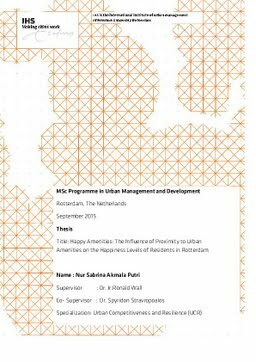 The aim of this research is to explain the relationship between proximity of urban amenities and happiness levels of residents in Rotterdam. It assigns the happiness levels as the dependent variables and proximity as the main independent variable. Proximity in this context means the physical distance between locations in an individual residential area to several urban amenities. To determine the degree of accessible proximity, this study particularly assigns an aspect of service amenities to each amenity location. Additionally, this research also identified weather any variance exists in the level of happiness among cultural diversity which is influenced by the proximity to urban amenities. It attached strongly socio-cultural background from Dutch and Non-Dutch group of residents in Rotterdam. Thesis Advisor Wall, R., Stavropoulos, S.